TIGARD — Plain and simple, the Pacers felt like they had something to prove. 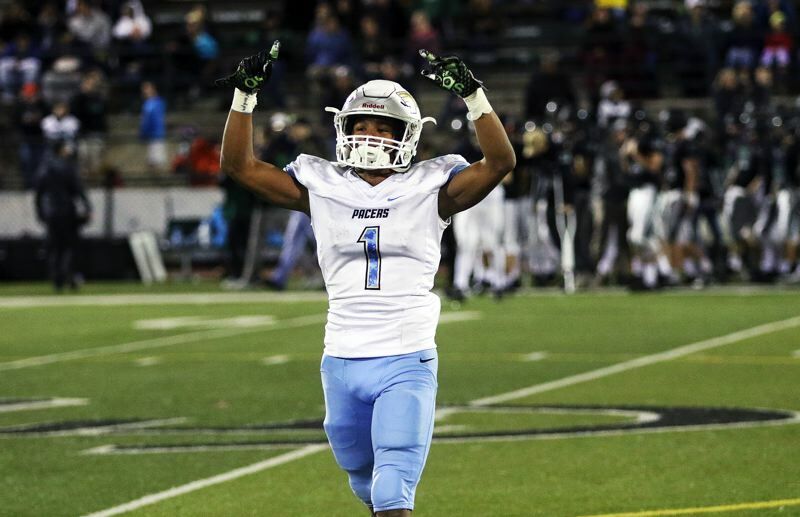 What wasn't so simple for the Lakeridge High School football team was proving it against an undefeated Tigard squad. But Lakeridge wasn't about to let anything stand in its way — not even the talented Tigers. 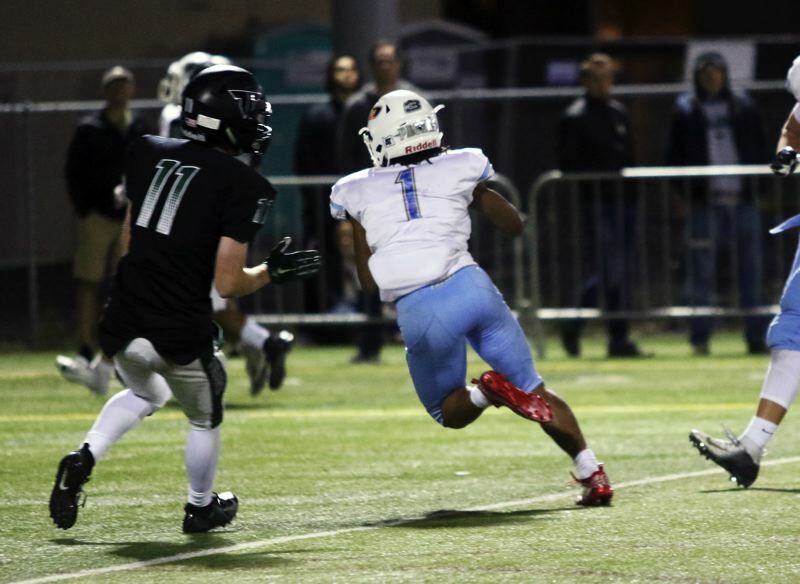 The Pacers, stepping up and making big plays on both sides of the ball, scored 21 unanswered second-half points on their way to posting a 48-38 victory over previously unbeaten Tigard in a Three Rivers League game played Friday at Tigard High School. "This is a huge win. 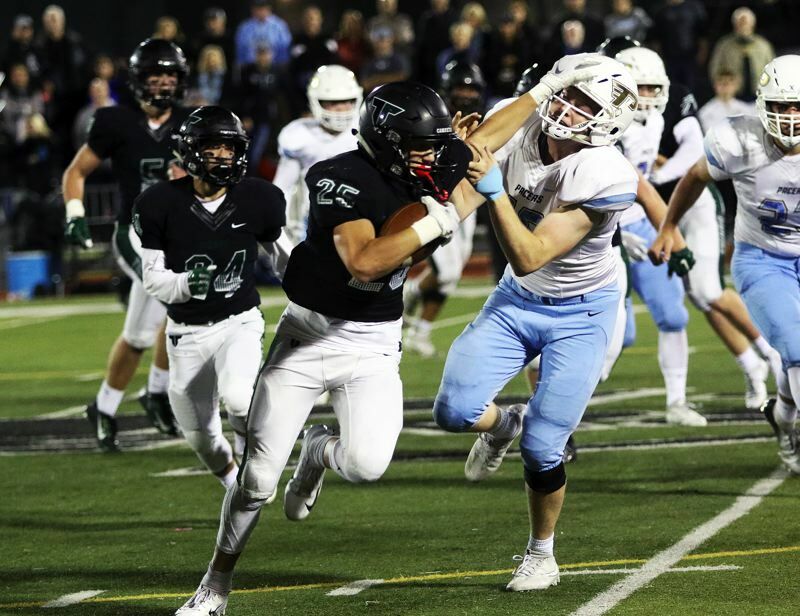 Tigard was 6-0, we were 4-2, and we had something to prove," said Lakeridge senior quarterback Charlie Maynes, who threw five touchdown passes in the contest. 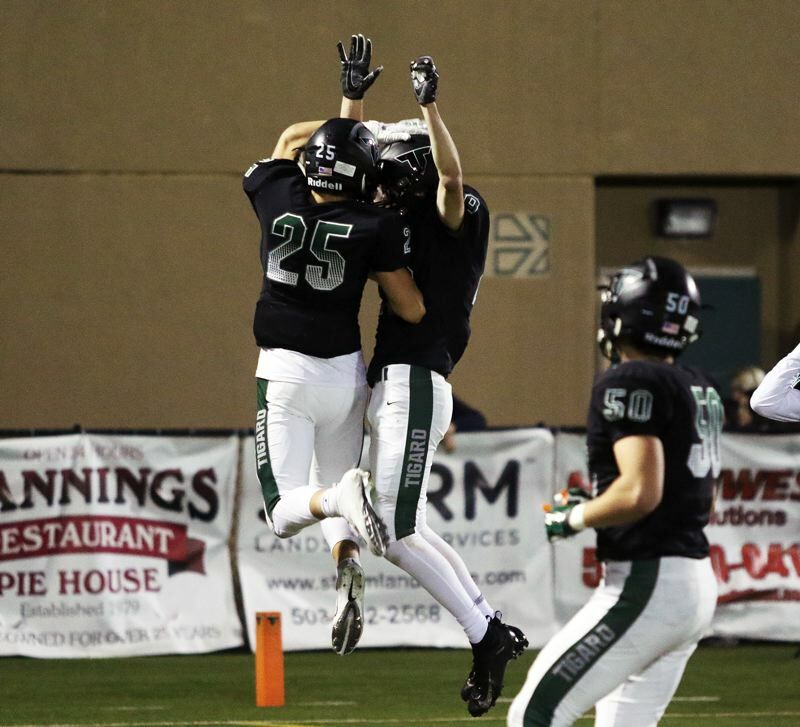 "We knew that Tigard was an excellent football team, coach (Craig) Ruecker is an excellent coach and they have excellent players. And we went out there and we battled." "We were really hungry for a big win. 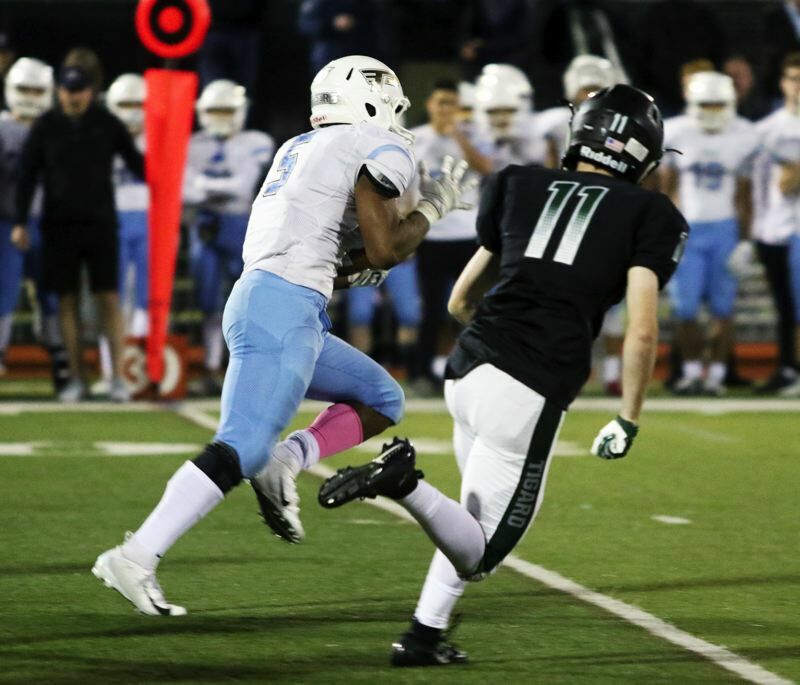 We think we deserve a higher ranking, and we wanted to prove that," said Lakeridge senior receiver Will Scadden, who had three touchdown receptions in the win. "It was a great game. Our coach was telling us that we needed to bring the fight to them. So we did what we were supposed to." 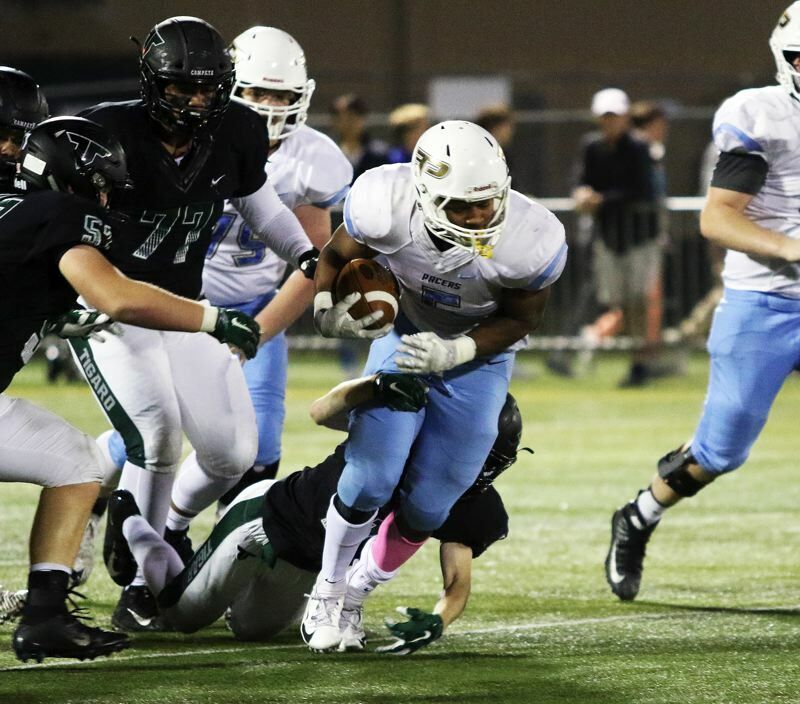 "It's pretty big," said Lakeridge junior running back Jalen John, who rushed for 277 yards. "We know the talent that we have, it's just a matter of playing at our highest ability." With the win, the Pacers improved to 3-1 in Three Rivers League play and to 5-2 on the season. "We know we're a top team, and the state is starting to catch on," Maynes said. "We're going to ride this momentum as far as we can. We want to take it deep in the playoffs." 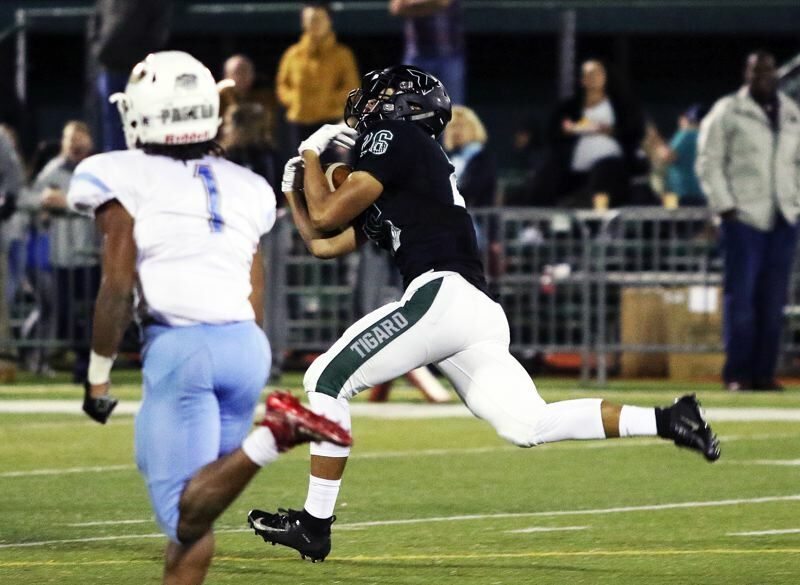 Tigard moved to 2-1 in TRL games and to 6-1 on the season with the setback. "We'll build off of this," said Tigard senior tight end/linebacker Fletcher Ahl, who had a strong game on both sides of the ball. "Now we know what this feels like, and we don't want that feeling any more. We have two tough games coming up, and we have to get stronger from this." 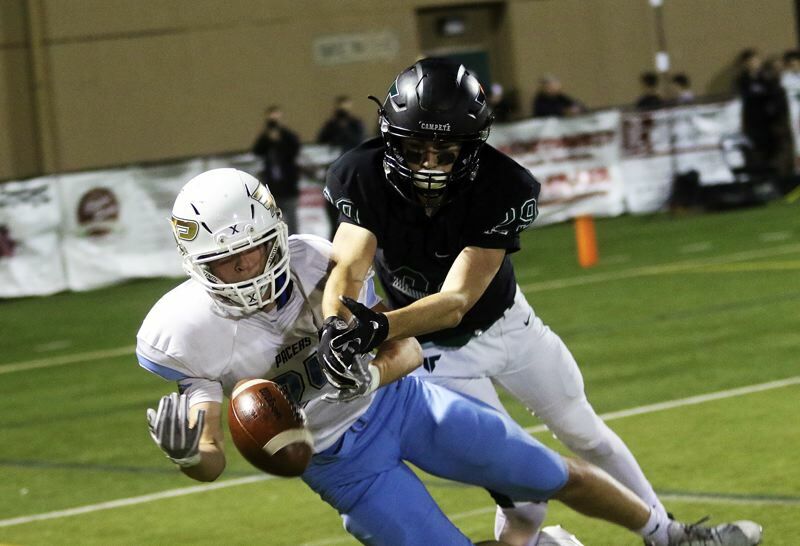 "Hats off to Lakeridge, they played a great game," said Tigard senior receiver Luke Ness, who had a pair of touchdown catches in the contest. "We can't just show up and think we're going to beat everyone. We have to come out and play hard against everyone. I think this is a wake-up call for us." 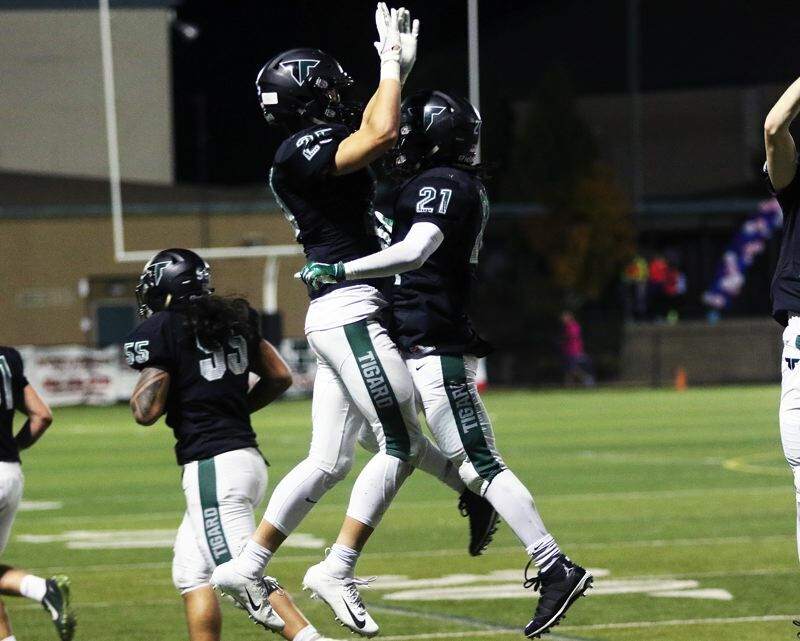 Tigard got off to a fast start in Friday's contest. A 22-yard pass from sophomore quarterback Drew Carter to Ahl moved the ball to the Lakeridge 1-yard line. Tiger senior Malcolm Stockdale scored on a run on the next play, giving Tigard a 7-0 lead with 4 minutes and 50 seconds left to play in the first quarter. The Tiger defense then forced Lakeridge into a three-and-out during the Pacers' following possession. 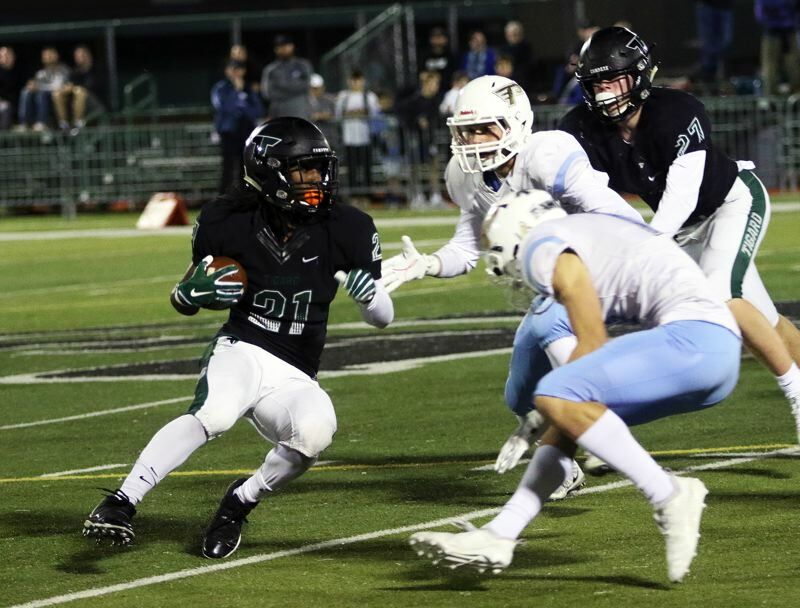 Tigard junior Max Lenzy blocked the ensuing Lakeridge punt, and Tiger junior Josh Burns recovered the ball in the end zone for a touchdown, which upped the Tigard lead to 14-0 with 3:46 left to play in the opening period. 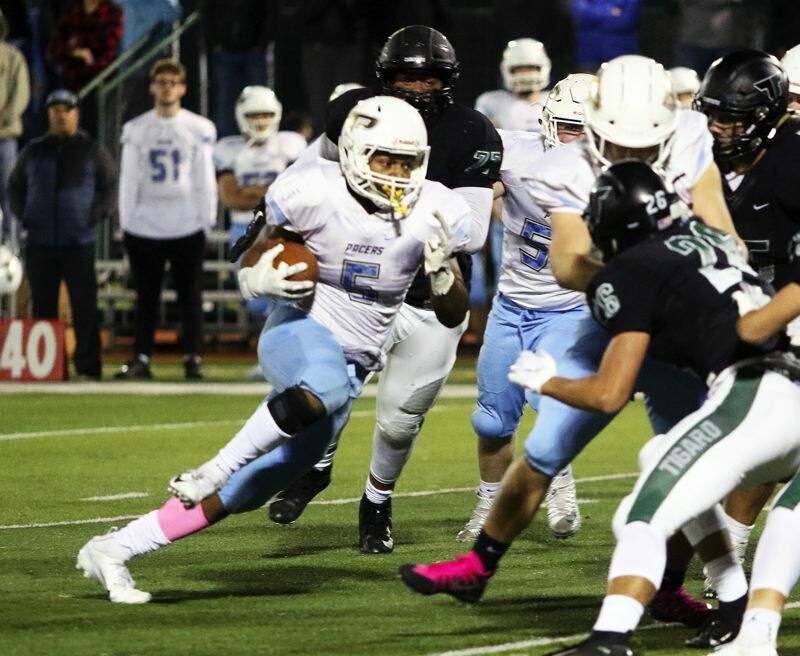 The Pacers answered right back, with John scoring on a 63-yard run on the ensuing Lakeridge possession, trimming the lead to 14-7 with 2:06 remaining in the first quarter. Then, after Tigard was whistled for a roughing-the-kicker penalty on a Lakeridge punt, the Pacers struck again. On the very next play following the penalty, Maynes and Scadden teamed up on a 64-yard touchdown pass play. The score tied the game, at 14-14, with 11:29 remaining before halftime. The teams remained tied until late in the second quarter, when the Pacers would take their first lead of the game. Maynes, from his own 32-yard line, threw a quick, short pass to senior Andre Martinez on the left side, and Martinez did the rest, sprinting down the sideline for a 68-yard touchdown pass play, putting the Pacers up 21-14 with 1:51 left in the period. The TD ignited a flurry of scores before halftime. On the very next play from scrimmage, Carter threw a 65-yard touchdown pass to Ness, tying the game at 21-21, with 1:25 remaining in the quarter. On the next play from scrimmage following that, John broke into the clear and scored on an 80-yard run, giving the Pacers a 27-21 lead, after the extra point attempt failed, with 1:12 left in the period. Tigard then quickly moved the ball down field. Runs of 15 and 22 yards by Stockdale, and a roughing-the-passer call on Lakeridge, put the ball at the Pacer 13-yard line. From there, Carter threw a touchdown pass to Ness on the left side of the field, giving Tigard a 28-27 lead with 15.6 seconds left in the quarter. The Tigers would take that one-point advantage to halftime. Tigard would strike again in the third quarter. A 47-yard pass from Carter to senior Jazz Ross helped set up a 32-yard field goal by junior Jackson Cleaver, which gave the home team a 31-27 lead with 7:07 remaining in the third quarter. 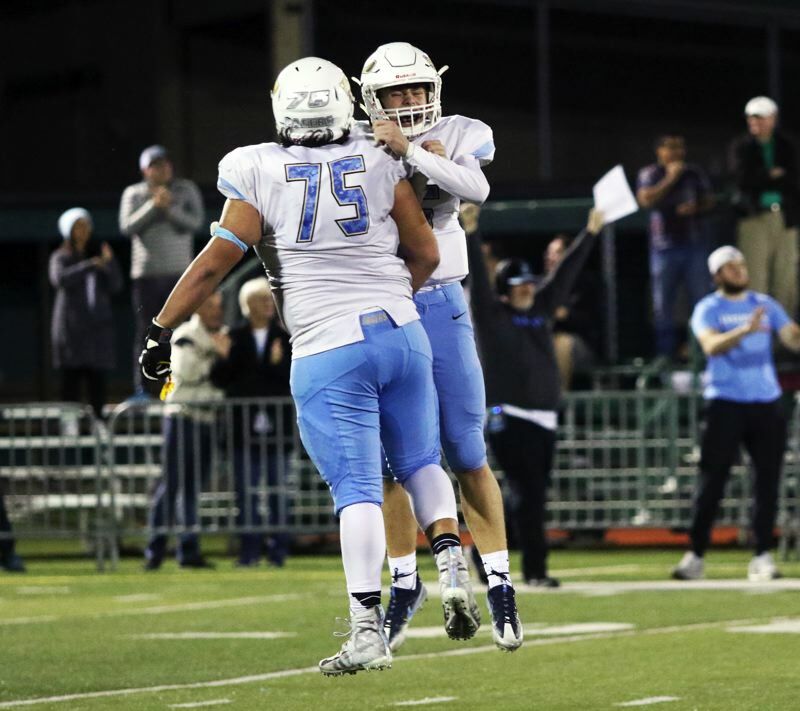 But Lakeridge came storming back — in a big way. With John and the running game working efficiently, the Pacers quickly moved the ball down field. Lakeridge then capped off a 60-yard drive with a 6-yard TD pass from Maynes to Scadden, giving the Pacers a 34-31 lead with 3:10 remaining in the third quarter. The Pacer defense then got into the act, with senior Javier John sacking Carter to help force a punt deep from Tiger territory. 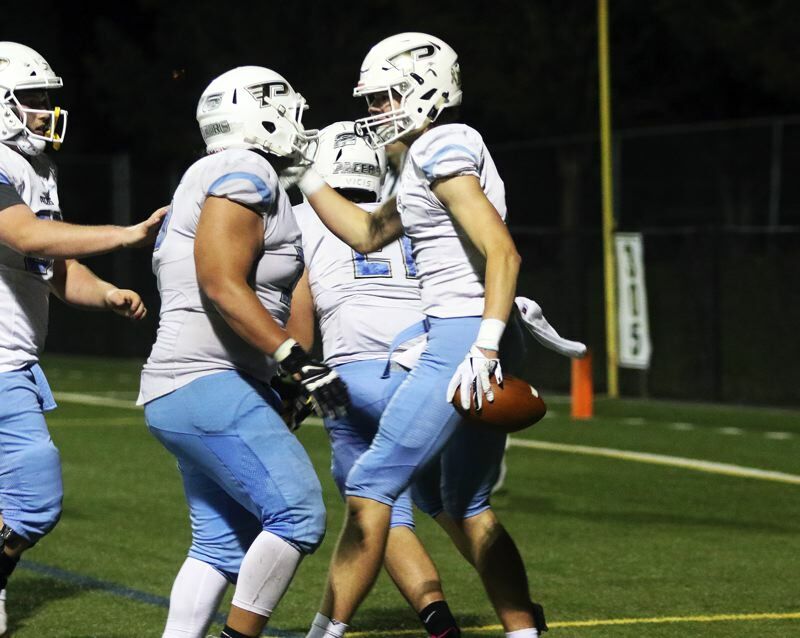 A short punt left Lakeridge with a prime scoring opportunity, and the Pacers took advantage of it, getting a 15-yard scoring pass from Maynes to Scadden — their third TD hook-up of the game — upping the Lakeridge lead to 41-31 with 10:46 left in the game. "He's a Division I receiver. He's the best receiver in the state, and I tell everyone that," Maynes said of the 6-foot-3, 200-pound Scadden. "He's my guy and he's a great receiver." "We were just executing," Scadden said. "I ran the right routes, the right depth. He got great protection. That was huge. We just did everything like we were supposed to." Lakeridge got another touchdown, with Maynes throwing a 16-yard scoring strike to Martinez with 3:12 remaining, making the score 48-31. Tigard, battling to the end, got a 7-yard touchdown run by Stockdale with 58.1 seconds left to play, making the final score 48-38. "We knew it was going to be a battle tonight," Maynes said. "Going into half it was 28-27, and both sides of the ball stepped up. The defense is so fundamentally sound. They were excellent." "This is huge," Scadden said. "This was a must-win game for us. We needed some momentum. We just wanted this more than then they did." "The difference was that we didn't beat ourselves, like we did against West Linn and Sherwood," Jalen John said. "I feel like we really paid attention. Our coaching staff has been emphasizing details and discipline, and I feel like we took care of that pretty well." For the game, Jalen John ran for his 277 rushing yards on 26 carries. "This was awesome," he said. "I wouldn't have done anything without my dude upstairs, and my linemen." Maynes completed nine of 19 pass attempts for 205 yards and five touchdowns. "We believe in our guys, I believe in my receivers," he said. "Jalen is an animal in the running game, a once-in-a generation-type player. And our O-line played phenomenal tonight. Everything opened up for us. We played how we knew we could play." Scadden had four receptions for 98 yards. Martinez had three catches for 87 yards. 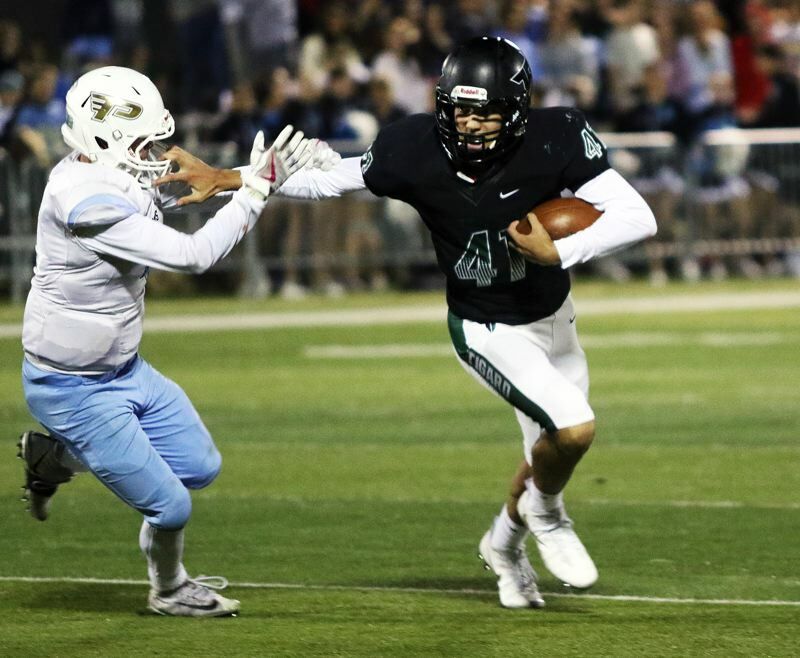 For the Lakeridge defense, senior Casey Smith had two quarterback sacks. Javier John had a quarterback sack and a tackle for a loss. Junior Ty Glumbik had a quarterback sack. Senior Jackson McGinley and junior Ronin Murphy each had a tackle for a loss. For Tigard, Carter completed 14 of 28 pass attempts for 264 yards. Ahl had three catches for 59 yards. Lenzy had three catches for 39 yards, Ross three catches for 65 yards and Ness had two catches, both touchdowns, for 78 yards. "That stuff is cool, but it's more of a team game," Ness said. "It's not about me, it's not about my touchdowns, it's about how we play as a team. No one is satisfied with our outcome tonight, so we want to come back strong next week." Stockdale led the Tigard rushing attack with 126 yards on 30 carries. 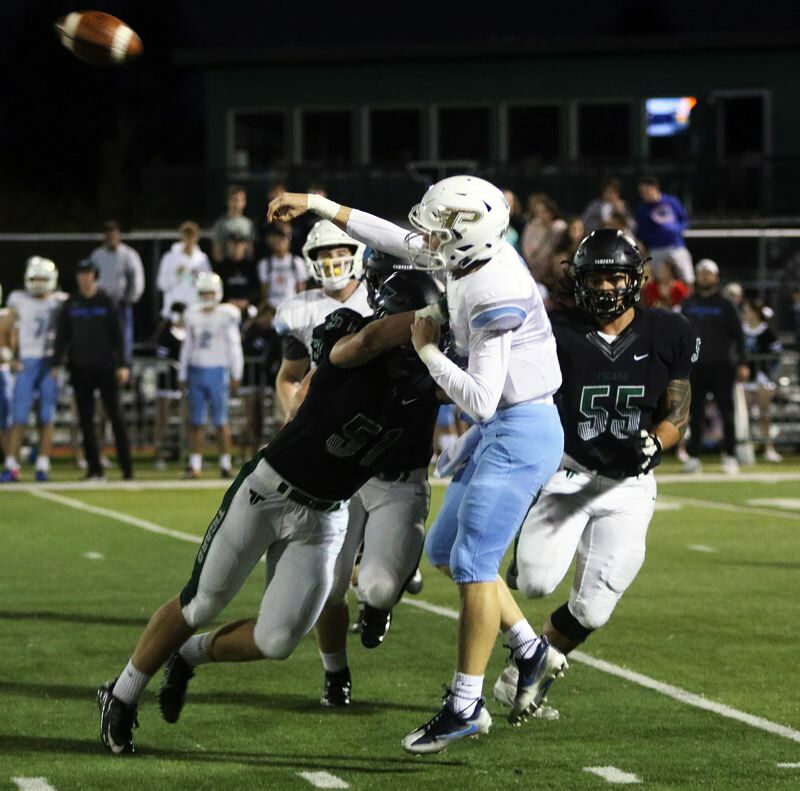 For the Tigard defense, senior Mitchell Cross had a quarterback sack. Ahl had two tackles for losses and senior Isaia Porter had a tackle for a loss. "We never stopped fighting, but they got us today," Ahl said. "They played a good game. We just have to execute. When we do, we're good." "This could be a good thing. We'll see. We just have to come back stronger," Ness said. "We'll remember this feeling and come back strong next week." 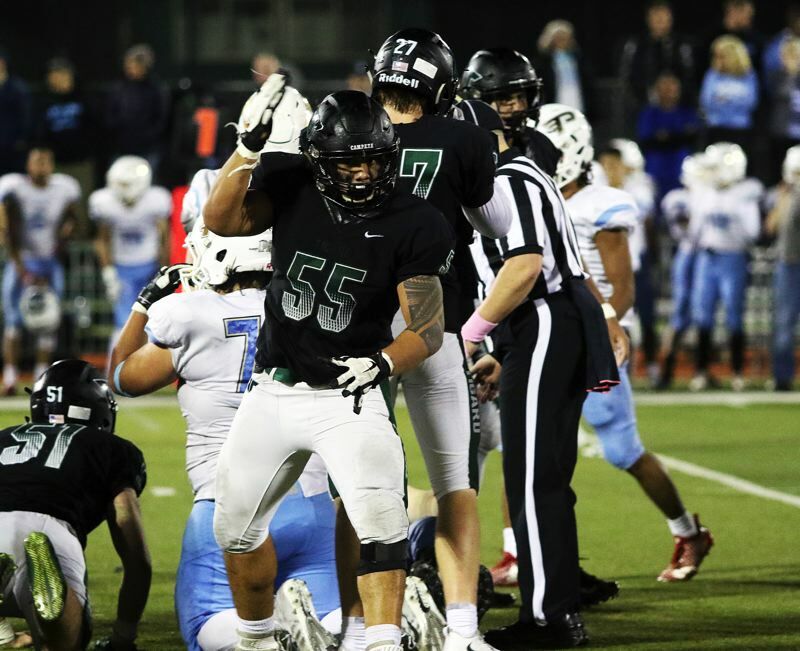 Tigard faces another tough league test on Friday, when it plays at West Linn at 7 p.m. Lakeridge will be home to face Bend on Friday in a non-league game starting at 7 p.m.